Methods of Lubrication.—There are numerous ways to supply lubricant to bearings. The more common of these are described in the following. Pressure lubrication, in which an abundance of oil is fed to the bearing from a central groove, single or multiple holes, or axial grooves, is effective and efficient. The moving oil assists in flushing dirt from the bearing and helps keep the bearing cool. In fact, it removes heat faster than other lubricating methods and, therefore, permits thinner oil films and unimpaired load capacities. The oil-supply pressure needed for bushings carrying the basic load is directly proportional to the shaft speed, but for most installations, 50 psi will be adequate. Splash fed applies to a variety of intermittently lubricated bushings. It includes everything from bearings spattered with oil from the action of other moving parts to bearings regularly dipped in oil. Like oil bath lubrication, splash feeding is practical when the housing can be made oiltight and when the moving parts do not churn the oil. The fluctuating nature of the load and the intermittent oil supply in splash fed applications requires the designer to use experience and judgment when determining the probable load capacity of bearings lubricated in this way. Oil bath lubrication, in which the bushing is submerged in oil, is the most reliable of all methods except pressure lubrication. It is practical if the housing can be made oil tight, and if the shaft speed is not so great as to cause excessive churning of the oil. Oil ring lubrication, in which oil is supplied to the bearing by a ring in contact with the shaft, will, within reasonable limits, bring enough oil to the bearing to maintain hydrodynamic lubrication. If the shaft speed is too low, little oil will follow the ring to the bearing; and, if the speed is too high, the ring speed will not keep pace with the shaft. Also, a ring,revolving at high speed will lose oil by centrifugal force. For best results, the peripheral speed of the shaft should be between 200 and 2000 feet per minute. Safe load to achieve hydrodynamic lubrication should be one-half of that for pressure fed bearings. Unless the load is light, hydrodynamic lubrication is doubtful. The safe load, then, to achieve hydrodynamic lubrication, should be one-quarter of that of pressure fed bearings. Wick or waste pack lubrication delivers oil to a bushing by the capillary action of a wick or waste pack; the amount delivered is proportional to the size of the wick or pack. Lubricants: The value of an oil as a lubricant depends mainly on its film-forming capacity, that is, its capability to maintain a film of oil between the bearing surfaces. The filmforming capacity depends to a large extent on the viscosity of the oil, but this should not be understood to mean that oil of the highest viscosity is always the most suitable lubricant. For practical reasons, an oil of the lowest viscosity that will retain an unbroken oil film between the bearing surfaces is the most suitable for purposes of lubrication. A higher viscosity than that necessary to maintain the oil film results in a waste of power due to the expenditure of energy necessary to overcome the internal friction of the oil itself. Grease packed in a cavity surrounding the bushing is less adequate than an oil system, but it has the advantage of being more or less permanent. Although hydrodynamic lubrication is possible under certain very favorable circumstances, boundary lubrication is the usual state. 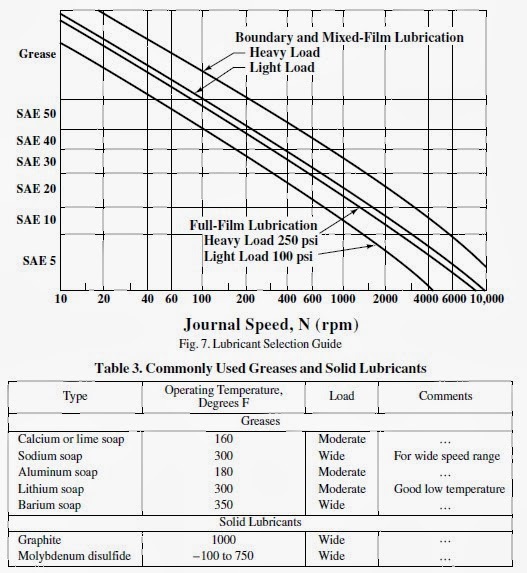 In selecting lubricants for journal bearing operation, several factors must be considered: 1) type of operation (full, mixed, or boundary film) anticipated; 2) surface speed; and 3) bearing loading. 5) Prevent intimate metal-to-metal contact under conditions of high unit pressure which might destroy boundary lubricating films. fairly high-load applications, greases are widely used as bearing lubricants. Although fullfilm lubrication with grease is possible, it is not normally considered since an elaborate pumping system is required to continuously supply a prescribed amount of grease to the bearing. Bearings supplied with grease are usually lubricated periodically. Grease lubrication, therefore, implies that the bearing will operate under conditions of complete boundary lubrication and should be designed accordingly. Lubricating greases are essentially a combination of a mineral lubricating oil and a thickening agent, which is usually a metallic soap. When suitably mixed, they make excellent bearing lubricants. There are many different types of greases which, in general, may be classified according to the soap base used. Information on commonly used greases is shown in Table 3. Synthetic greases are composed of normal types of soaps but use synthetic hydrocarbons instead of normal mineral oils. They are available in a range of consistencies in both water-soluble and insoluble types. Synthetic greases can accommodate a wide range of variation operating in temperature; however, recommendations on special-purpose greases should be obtained from the lubricant manufacturer. Application of grease is accomplished by one of several techniques depending upon grease consistency. These classifications are shown in Table 4 along with typical methods of application. Grooves for grease are generally greater in width, up to 1.5 times, than for oil. 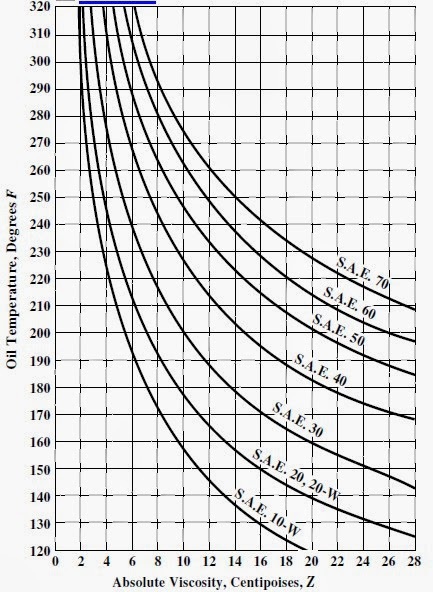 Coefficients of friction for grease-lubricated bearings range from 0.08 to 0.16, depending upon consistency of the grease, frequency of lubrication, and type of grease. An average value of 0.12 may be used for design purposes. Solid Lubricants: The need for effective high-temperature lubricants led to the development of several solid lubricants. Essentially, solid lubricants may be described as lowshear-strength solid materials. Their function within a bronze bearing is to act as an intermediary material between sliding surfaces. Since these solids have very low shear strength, they shear more readily than the bearing material and thereby allow relative motion. So long as solid lubricant remains between the moving surfaces, effective lubrication is provided and friction and wear are reduced to acceptable levels. lubricant. These changes, which are due to the physical state of the lubricant, are reversed when cooling takes place. The effects just described also partially explain why fatty acid lubricants are superior to paraffin base lubricants. The fatty acid lubricants react chemically with the metallic surfaces to form a metallic soap that has a higher melting point than the lubricant itself, the result being that the breakdown temperature of the film, now in the form of a metallic soap is raised so that it acts more like a solid film lubricant than a fluid film lubricant.